Seventeen years ago, Nintendo upended expectations by launching its state-of-the-art GameCube console without a Mario game. At the time it seemed crazy – after all, Mario titles were key to the success of its prior console launches – but this time, there was something else awaiting early adopters instead. 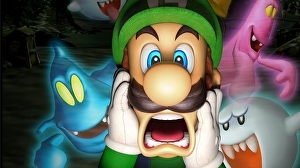 Luigi’s Mansion was – and is – rather an unusual game. Combining Nintendo’s charming character design and fun gameplay mechanics with a horror-themed mansion certainly isn’t something anyone expected at the time, but since its release, the series has become somewhat of a fan favourite. And now, the original game has relaunched on Nintendo 3DS in one of the most interesting conversions we’ve seen in some time. As a GameCube launch title, Luigi’s Mansion remains an interesting piece of work. In many ways, the visual stylings of modern Nintendo games can be traced back to this release. With an ample polygon budget and new rendering techniques, Nintendo started down its path towards matching its renders of Mario and friends using real-time in-game graphics. As such, in its original form, Luigi’s Mansion still holds up from a visual perspective. This week, a launch GameCube title arrives on Nintendo 3DS in its twilight years, with Nintendo employing the expertise of Grezzo – the studio responsible for the 3DS ports of Ocarina of Time and Majora’s Mask. First impressions are certainly positive. Whether you’ve played the original or not, this new conversion is instantly appealing. Character models are smoothly rendered, texture work is all-new and beautiful and there are a lot of great touches strewn about the environment. The way coins and money jump about the screen, the cloth physics that appear when using your vacuum, not to mention the reflections in mirrors, they all look superb. The flashlight beam is also a juxtaposition of what seems to be a per-pixel light drawn across the environment combined with a transparent cone and lens flare effect. It’s all very cohesive and at first glance, you might not even realise that the game’s visuals have been completely revamped.